Charles Spurgeon was one of the most influential and prolific preachers of the modern era. Last year, Lexham Press released the first volume of the Spurgeon Commentary Series, Galatians. Since then, we’ve been working hard on completing the remaining nine volumes in this series. We’re nearing completion of these volumes and we’re proud to announce that they will be released on January 15. You have just a few more days left to enjoy Pre-Pub pricing on this amazing collection. That means you can get all nine volumes for over 40% off! 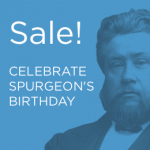 Spurgeon’s writings on the Bible fill dozens of volumes and encompass both published books and spoken sermons. The Spurgeon Commentary Series looks to collect his thoughts from across his corpus in an easy-to-use commentary format that is tied to the biblical text. We’ve gone back and curated excerpts from Spurgeon where he’s explicitly citing a verse and from places where he’s alluding to the text—something a simple search wouldn’t be able to do. We’ve also enhanced the Logos editions with amazing functionality, tagging illustrations and application content with preaching themes so that they pop up when you’re using the Sermon Starter Guide. This functionality saves time if you’re preparing sermons or are trying to find content from Spurgeon on specific topics. “[Spurgeon] could hardly say three sentences without including a phrase, a reference, or an allusion to Scripture. Whenever he spoke, no matter the topic or the venue (even when he was delivering a “lecture” to an academic audience), there was an abundance of Scripture in the message. His daily conversation was saturated with Bibline. Nearly any talk he ever gave would likely exceed some of today’s “expository” sermons for sheer biblical content. “Elliot Ritzema has created a remarkable and eminently useful resource by culling Spurgeon’s expository comments, combining them with key explanatory sections drawn from Spurgeon’s sermons, cataloguing and organizing them by chapter and verse, and giving us this wonderful commentary from the Prince of Preachers. Charles Spurgeon was a truly gifted orator and author. The Spurgeon Commentary Series is designed for functionality, usability, and readability to make Spurgeon’s writing easier than ever to understand and apply. The nine volume New Testament Letters Collection is shipping digitally on January 15. They’re over 40% off on Pre-Pub until then. The first volume in the series, Galatians, is already available digitally and in print.